Residence of Vernon D. Fitch, Esq. Back reads, "The Elms Sept 1886. Residence of Vernon D. Fitch esq. Hyde Park." 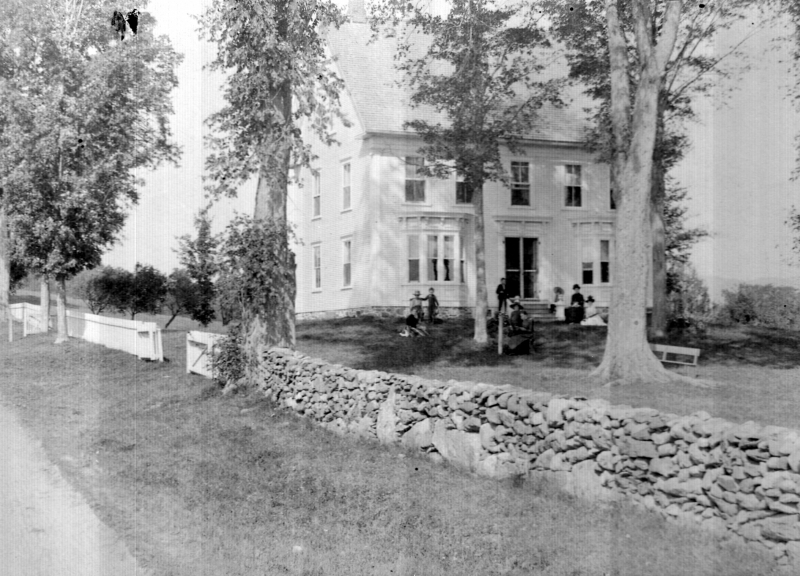 The photo shows a house with both a stone wall and wooden fence bordering the yard. A few tall elms stand in the yard and a few other hardwoods are along the dirt road. This is summer with leaves on. People are standing and sitting in front of the house. Esther Munroe Swift writes on 2005-2-5: Hamilton Child\'s Gazetteer & Business Directory for Lamoille County c.1884 says Vernon D. Fitch lived on road 37 and was a farmer with 97 acres. The house & grounds would indicate that he was pretty sucessful. 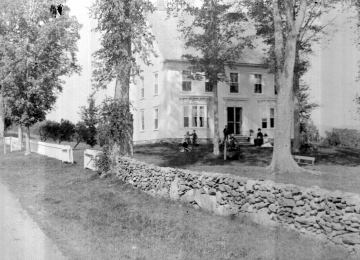 Julie Rohleder writes on 2005-10-26: This house is now the Fitch Hill Inn. We are the current owners/innkeepers and have been looking for old photos of the house. The large elm in the front yard (tree furthest on the right) was a rotting stump when we bought the inn 2 years ago. It had been there during the 1970s when the Levesque family owned the house as their residence, according to one of the sons who grew up here. There is also a covered porch on the front of the house now. The stonework under the right hand bay window has the initials EF carved into it, for Erastus Fitch, who was Vernon's father. Vernon and his wife Elizabeth died in 1924 and their adopted daughter Ellen Bailey Fitch Noyes inherited the property. Ellen lived in the home with her husband Lucius Noyes until her death in 1952. In 1953 it was sold out of the family to the Wayne and Sylvia Page, and has changed hands several times since. It first became a bed and breakfast in the late 1980's.